Can you tell it's autumn here? I made this for lunch yesterday and Grant and I both loved it (we ate it with a little aioli mixed in). I don't have exact measurements for you - adjust to taste. Cut up and roast some beetroot (about 1 per person), onions and pumpkin. Cook your quinoa in chicken or beef stock, and drain. 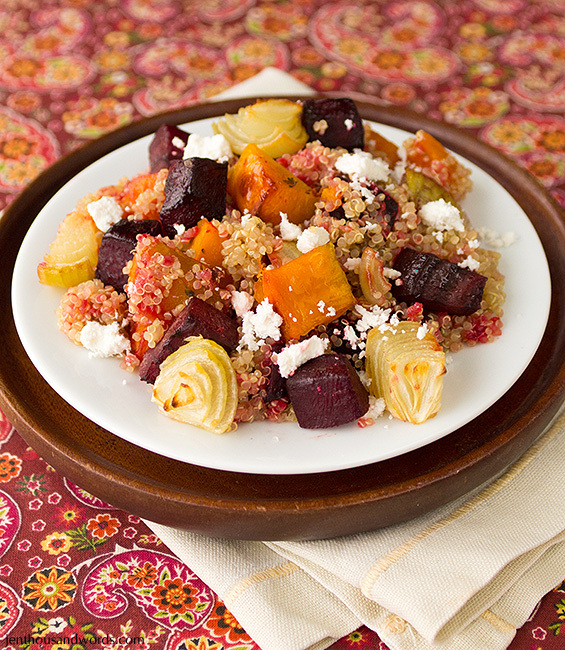 Mix roasted veg into the quinoa, and add some crumbled goat's cheese. Season to taste. That's it! Super easy, healthy and delicious.